While I'm not sure, my gut feeling is that it's not polyurethane. That's a dinky UV printer... The Vutek GS5000 is the kind of big dog my clients tend to use. With an 8+ color inkset and lots of resolution modes and number of passes to choose from subtle gradient are really nice at the higher settings. Gotta have those light colors and black inks - 4 color inksets are never going to look great. Maybe in 10 years' time, they'll actually have 8- or 12-colour models available for the same price as current Roland printers (i.e. $20-40k). A $500k-or-greater printer just isn't viable for printing fine-art photos, which are neither 2m-5m wide, nor produced in such huge numbers as to justify the purchase price of such a machine. I'm looking at DuPont SentryGlas - Expressions. They've done 10 year testing in Arizona under extreme lighting conditions. Yes, Glass was what I expected as a solution too. In the past (20 years or so) I have used a local insulating glazing company to assemble the glass sheets I silkscreen printed for an outdoor sign. I used the different layers to create some interaction for passersby, the texts shifting to the background etc. A text/vector design on three inside surfaces including the white glass background. This insulating glass had a silica in the profile sealed in to capture any moisture. The printing had two steps, an etch on the glass first of the design to create a better bond and then alkyd based ink that hardens on oxide. It lasted longer than the lawyer firm it was created for. You might consider that method too and have the front glass printed at the inside with UV curing inks + a white ink for reflection and add white glass at the back. It is possible with tempered glass too for better strength. In that case no extra polymers are used in the image layers that could create issues. The process could be less expensive than what you describe. Prolonged exposure of UV cured inks in sunlight is not without issues though. I have had problems with polycarbonate sheets printed with UV curing silkscreen inks. Both the thermoforming of the polycarbonate afterwards and sunlight exposure did harm the bond of the ink and reduce the flexibility of the ink. There are however new UV curing inkjet inks for thermoforming that may fit this purpose. There are also solvent inks that could be better in this case. Or more exotic, a silicate based ink for glass (SolGel, Fraunhofer) or actual ceramic pigment (fritte) inks for special inkjet printers. The last have to be fused. Tiles are already made that way. Edit: In the sign industry and other industrial print facilities that use (eco)solvents or UV-curing inks the inkset often does not go beyond CMYK, if more then only CcMmYK and the last often again compromised when a white ink, transparent or metallic ink is added. For speed you will see 2x CMYK as well. I do not know a CcMmYKkkRGB inkset in use in that industry like we know in our niche, not to mention one that has a white ink as well aboard. Metallic ink printers exist too and they compromise on other inks then. Sometimes a CcMmYK printer model allows a spot color ink or two added. With rigid media one could print in register the CcMmYK etc image first on one flatbed printer and the white, metal, varnish on another but that's it in PRACTICE in my opinion. Durst, Canon/Océ Arizona, Fuji Acuity, Inca Eagle are the main UV curing inkjet printer models and be aware that their inks or inks from other suppliers often are aimed at specific media ranges and do not have the properties for another range of substrates. December 2012, 500+ inkjet media white spectral plots. Such inksets are already around and Roland should have them if they care about image quality. Big shops gravitate to that kind of printer because they are fast, can handle the work that would otherwise require a dozen dinky printers and can accept surprisingly affordable UV inks when bought in large quantities. Ink costs are a fraction of aqueous and solvent ink costs. Shops that have such printers can provide UV prints to artists like us for surprisingly affordable prices - similar to what it would cost to make prints on the $5000 aqueous printers that we might be able to own. Not a bad deal at all. You don't want the headache of owning one of these pritners unless you're doing tons of printing on it. You might consider that method too and have the front glass printed at the inside with UV curing inks + a white ink for reflection and add white glass at the back. It is possible with tempered glass too for better strength. In that case no extra polymers are used in the image layers that could create issues. The process could be less expensive than what you describe. Prolonged exposure of UV cured inks in sunlight is not without issues though. laminator. We are able to print up to 94" x 192"...."
As you see from the quote above, they have a proprietary printing process, using their proprietary inks, and the laminated end result adheres to their testing requirements, which they guarantee. Since this is such a huge project, I would hand over the image to the company, and the mounting to architects, engineers and designers, so that they would be in charge of the installation with qualified installers. Since the panels would be hung on an armature, presumably, the glass would be impervious to rain from any holes, etc, for mounting. I like your idea about the back panel being frosted or white. One thing that occurs to me, is that while being back-lit the image would be well seen at night, perhaps not so much during the day. A white panel from behind, might solve the problem, giving me the best of both worlds. Thanks again for your thoughts and suggestions, Ernst - always a pleasure hearing from you. Well there are 8 color CcMmYKkk UV inksets and the Epson Surecolor S70 uses an 11 color solvent CcMmYKkkOWMs inkset that incorporates Orange, White and Metallic. These are THE two UV and Solvent inksets attractive to those wanting to make the highest quality UV and solvent prints today. R and B inks really don't help much and I think you'll see them disappear in the future. Don't leave Vutek off your list of UV printer manufactures - the rest you mention (except Inca) are late comers to the party, and trail in sales. The Epson inkset only has a stated permanence of 3 years (2 years if also using the orange ink, 1 year if using the white ink and just 3 weeks if you use the metallic silver ink). I'm assuming this is outdoors, unprotected, though - would love to know how this translates to Wilhelm years or Aardenburg megalux-hours, in order to make a meaningful comparison with other printers. I wonder if the yellow pigment they use in their GSX inks is more lightfast than those on their K3 and HDR inksets - they say it's a 'new, more permanent' ink, but compared to what? Obviously, the inks will be different, but it's common to suspend the same pigment in different solvents (whether aqueous, solvent, UV-curing, acrylic paint, oil paint, watercolours or anything else) to give a different ink or paint. Well there are 8 color CcMmYKkk UV inksets and the Epson Surecolor S70 uses an 11 color solvent CcMmYKkkOWMs inkset that incorporates Orange, White and Metallic. These are THE two UV and Solvent inksets attractive to those wanting to make the highest quality UV and solvent prints today. Are they actually used in the industry right now and can they print as flatbeds on glass sheets? I was not aware that the very recent Epson S70 had such a wide inkset but it does not change much for the job Mark has to do. Yes, that's outdoors where aqueous inks won't last 2 weeks. UV Curable longevity is much greater than solvent. Are they actually used in the industry right now and can they print as flatbeds on glass sheets? Part of what I'm trying to emphasize here is the liquid lamination. Liquid lamination will improve durability and lightfastness by a factor of 2x-10x. If you're going outdoors don't overlook it. Arguable - after all, UV inks use exactly the same coloured pigments as solvent and aqueous inks. The only difference between solvent and aqueous inks is in the solvent in which they are suspended - hydrophilic in the case of aqueous inks, hydrophobic for solvent inks. Once the solvent has been absorbed or evaporated, the pigment particles are exactly the same. UV inks have an additional difference - they are suspended in a polymer layer formed by the polymerisation of UV-sensitised monomers, rather than adherent to a surface - but, given that UV inks, by definition, cannot be opaque to UV light, the pigments would be subject to UV bombardment just like any other pigment print (they'd be sealed against atmospheric pollutants, though). Perhaps the major difference is in the substrate (microporous coatings for aqueous, uncoated vinyl for solvent, almost anything for UV) that accounts for this difference in durability, rather than the inks themselves? After all, outdoor display in a city tends to attract many more pigment-destroying pollutants than just UV light, and microporous coatings are terrible as far as resistant to chemical attack goes, given their huge surface area compared to the others. Do you think other systems would actually outlast SentryGlas® Expressions™, which is fused between layers of safety glass? Think windshield glass. They have known direct sun longevity testing, actual real time testing in direct Arizona sun. Are you saying any system you are discussing can outlast or better SentryGlas® Expressions™ in terms of sturdiness, and light-fastness, and carry a guarantee? Remember, there is no possibility of permeating any seal, because there is no seal - it is all one incorporated entity. Tallahassee is inland enough that we haven't had anything like a Katrina-like event, but we get big winds and unbelievable rain storms. In the summer we can get rain almost every afternoon and I'm talking real gully-washers for short periods. Whatever I come up with has to be able to withstand the elements here. The SentryGlas® Expressions™ seems like the hardiest of all the applications that have been thus far discussed, and even now, I'm having doubts as to the light-fastness beyond say 15 years, realistically. Nothing on this scale is easy, though. It feels like the industry is just at the tipping point, however. An artistic display made out of safety glass will last until someone decides to throw a rock at it. In an average city, that'd be 25 days, not 25 years. Safety glass or not, it's going to break - the 'safety' part just stops it from raining glass slivers everywhere. Just wondering - can UV printers also be used to make prints on fine art paper? Or are they limited to metal, ceramic, plastics and other rigid materials? Yes, although that would be unusual to do so. Roll to roll printing is common on vinyl, canvas and other materials. Then it isn't safety glass. I've made prints that been mounted between safety glass that have been shoot at. It did leave a small mark but didn't break. Out of interest, what did you end up going with? Did the Sentryglas Expressions work out? If you went with them, how is their print quality and colour accuracy like? Any idea what sort of inks/print process they use for the layer in the middle? 10 years of outdoor display probably means 10 centuries of indoor display - just as well, given some of the museum relics some photos are displayed alongside. Holy resurrect an old dead thread Batman! There were so many issues that we (client and me) could not get past that I pulled out of doing that one. Liability issues, and longevity issues ultimately along with contractual guarantees. I will not be attempting to do outdoor work in the future due to the relatively short life span, particularly in the harsh Florida sun. As for liability, I looked into (glass) product liability briefly and that was enough to make me want to run. I ended up buying a customized 2010 Mac Pro 12 core with 128GB Ram and 4 GB mSATA drives so that I could edit multiple layers in "real time" rather than doing edits then up-rezzing the images. It was extravagant but the project budget handled it no problem. BTW - it sure was nice having 6 guys doing the installation under my supervision. Working big like this definitely has its challenges. I'm so glad I walked away from the other outdoor one. Until someone can guarantee at least 20-25 years, possibly 30, I think I'll pass on the outdoor work. Thanks for asking Shadowblade (wish I knew your first name). Looks good - was that done using laminated glass? How is the close-up image quality? Good enough for small (20x30") prints, or only really suitable for huge pieces? Did you get any idea of their print process (dyes vs pigments, aqueous, solvent, UV, etc.)? No-not laminated glass. Have not found anyone who does that work to my expectations yet. The images were initially made partly using a robotic system I built with a Nikon D810 as the end effector. Since the file size is pretty big to start with, I processed the images at first in NXD, then lightroom,then photoshop. I made the images for the diptych 4'x8' immediately out of NXD then began working a series of duplicate image layers that included lights, darks, saturation, curves,etc., hand blending everything. It's amazing to me that PS CC 2015 can handle such huge files at 300 ppi. At one point I believe the file was in excess of 20 GB. So to answer your question, the image is pretty sharp at about 1', very sharp at 5', and tack sharp at 20'. It is easy on the eyes close up. I had 16"x32" prints on ultra gloss aluminum made as test prints and they are astonishingly sharp. The images will scale up or down at this point. To me, that's the main advantage of working "real time or actual size" - it's much easier to scale down than to scale up. The scaled down images are clean, clear, crisp, sharp. Another reason I worked at the largest file sizes (actual size) was to avoid noise accumulating from stacking layers. In the end, the final image looks very much like a 20x30 print, but it has much more integrity having been edited full scale, so the finished work has as much dynamic range and tonality as I personally required. The pieces glow. Of course I made 44" wide glossy prints on my Z3200 and sent them along with the file as match prints. I guess you could go with direct UV-curable printing onto the back of a glass panel, backed with Dibond or another white material, or solvent-printed film facemounted onto glass or acrylic. 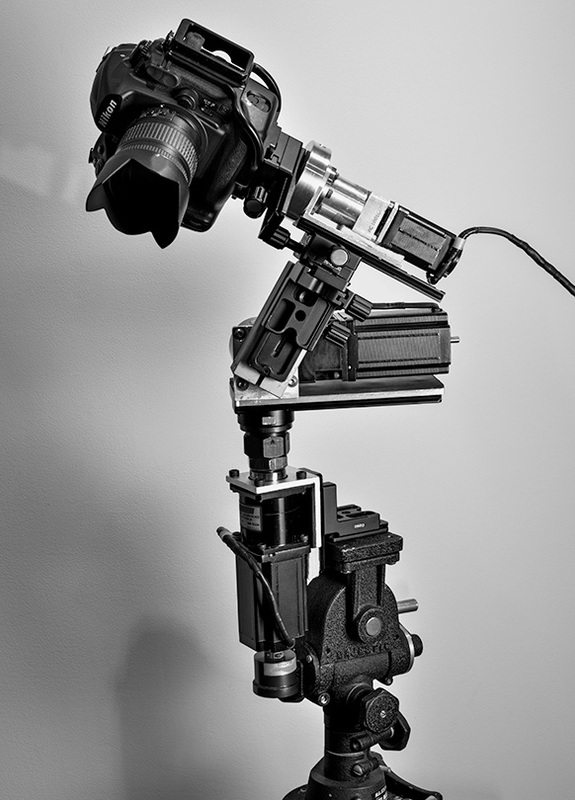 Looks a lot like a Gigapan-style rotational panoramic setup. Or does it do something different, given you had to build it yourself?